ROCHESTER, Minn. – The Gustavus softball team closed out the weekend with a non-conference doubleheader sweep over the University of Dubuque and Grinnell College Saturday at the Rochester Regional Dome. The Gusties earned two shutouts, defeating Dubuque 6-0 and Grinnell 7-0 to improve their overall record to 5-1. 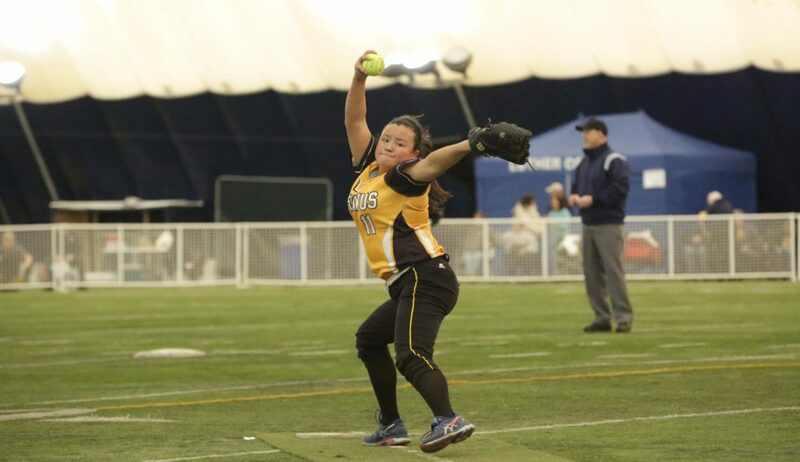 Hannah Heacox started the game on the rubber and notched her second seven inning, one-hit complete game shutout of the season to improve her record to 3-1. After registering a season-high 10 base hits against Dubuque yesterday, the Gustie bats stayed hot versus the Spartans. Gustavus picked up 11 hits and capitalized on early runs to earn the win. The Gusties scored three runs in the first inning and another two in the second to grab a 5-0 early lead while Heacox and the defense stood strong for seven innings. In the top of the first inning, Kim Kurtzweg (Jr., Arlington, Minn.) got on base with a double and scored off an Aly Freeman (Fy., Omaha, Neb.) sacrifice fly as Gustavus took a 1-0 lead, the eventual game-winning run and RBI. They added two more runs off three hits to claim a 3-0 lead. Two more runs in the second inning and another in the fifth secured the 6-0 victory. Kurtzweg (3-4, 2B), Emily Carlson (Fy., Burnsville, Minn.) (2-4, 3 RBI), and Ashley Beise (So., Loretto, Minn.) (2-4) led the Gustie offense. In her second start of the season in the circle, Jena Willis recorded her second complete game shutout, leading Gustavus to a 7-0 victory. Willis picked up eight strike outs along with allowing just one walk as she earned her second win. The Gustie offense picked up right where they left off in game one, tallying a season-high 12 base hits. Gustavus repeated its nice start from game one, also taking an early lead with a three-run first inning. The Gusties notched three hits including a Willis double and a two-run RBI single from Sidney Welp (Fy., St. Peter, Minn.), her first base hit and runs batted in of her career. The teams went scoreless the next few innings until the Gusties added two runs in the sixth and seventh innings, sealing the 7-0 win. Seven Gusties recorded base hits along with four registering multi-hit performances. Hannah Heacox (3-4), Emily Webb (So., Maple Lake, Minn.) (2-4, 3 RBI), Aly Freeman (2-4), and Sidney Welp (2-3, 2 RBI) led the Gustavus offensive output. The Gusties next prepare for their spring trip as they head to Kissimmee, Fla. March 9-13 to compete in the Central Florida Rebel Spring Games. These young ladies are on a roll! Can’t wait to see them in person! !